The Cat (Felis silvestris catus) is a small carnivorous mammal of the taxonomic family, Felidae. 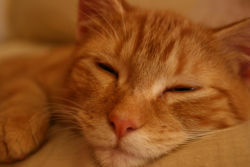 Currently, the cat is one of the world's most popular household pets. 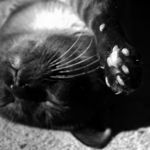 Cats were first domesticated at least 3500 years ago, when the Ancient Egyptians routinely used cats to keep mice and other rodents away from their grain. The average life span of a cat is about 15 to 20 years. 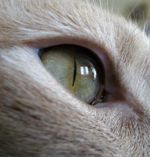 Cat can make its pupil very small and can see an object in a dark place. Sensitive whiskers and cushion foot. Cats are also vertebrates; their internal organs such as heart, lungs, stomach and reproduction organs are very similar to human organs. Skeleton is also so close, but the number of toes is different. Cats are extremely sensitive to light. To see an object, cats only need 1/7 amount of light how men need. So, in dark place, cat’s eyes are working so well. Cats are very good hearers. Sometimes, you can see that cats move their ears in a quiet place. That’s because they catch a tiny quiet sound. Dogs can hear just 20Hz to 40kHz, but cats can hear 30Hz to 60kHz. Cats can perceive even the distance between object and themselves by hearing. The olfactory sense of cats is much worse than dogs, but still better than humans. They classify foods into delicious, eatable and so on, and measure how foods are hot by nose. By the information from nose, they determine whether to eat or not. Cats have both deciduous teeth and eternal teeth like humans. The number of each tooth is 26-deciduous and 30-eternal tooth. Usually, eight-week-old kitties have deciduous teeth. During 3-month to 5-month-old period, they lose their deciduous teeth and get second teeth. Their grinding teeth are different from other animal – the job of grinding teeth is to tear into small size, not to chew. Their lingua have many projections which is made of keratin, which makes up our nails. So if you touch cat’s lingua, you may feel coarse. By these projections, cats can take foods, care fur, or drink water. There is a lot of provender for cat. And also you can buy many types of canned food for cat. Most cats prefer can to normal provender, but cans are more expensive and that can ruin cat’s diet habit. So if your cat doesn’t eat normal provender, you can mix them first. Then reduce amount of canned food continuously. Cat (Felis silvestris catus) A happy cat. This page was last modified on 7 March 2014, at 20:24.